This week’s Yiddish Song of the Week, Rosh-yeshivenik, is sung by Lifshe Schaechter-Widman, from Zvinyetchke, Bukovina. She was recorded by Leybl Kahn in 1954 in the Bronx. 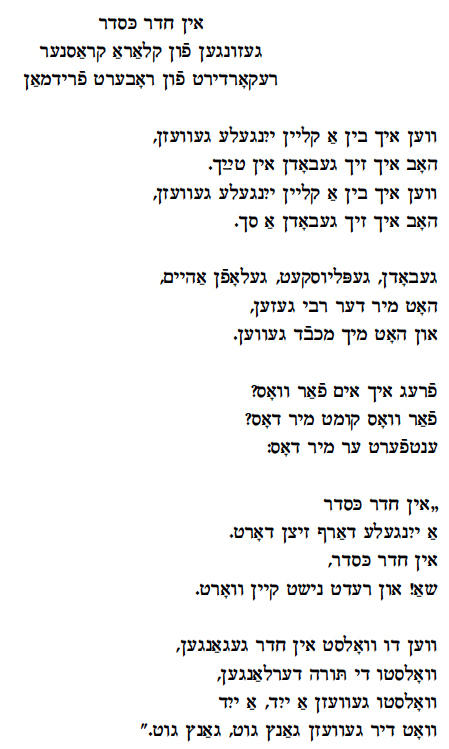 It is a song to pass the time, using the alef-beys (Yiddish alphabet), as its structure. The first son’s name “Avreml” starts with an alef, the second son’s name “Burekhl” with a beys, the third son’s name “Getsl” with a gimel and so on. In other versions, after the naming of ten sons, ten daughters are then named. Taytidl, didl, didl, didl, didl, didl, day. This is followed by a similar Ukrainian song text. I have only heard the word “Rosh-yeshivenik” in this song. The usual word is just “Rosh-yeshive” (director of a yeshiva, or religious school for boy) and I have to wonder whether in an earlier version it was not “Yeshuvnik”, a simple village Jew who was often made fun of. What I enjoy about LSW’s singing here is how the “oy” ornamentation, of which she is the master, is used for a humorous effect. In a way, she is parodying her own singing style: the words are bringing us only good news, but the “oys” and “oy veys” are comically telling us the opposite. S’iz a mul iz geven a rosh-yeshivenik. Oy vey, oy vey, a rosh-yeshivenik. Der rosh-yeshivenik hot tsu mazel khasene gehat. Oy vey, oy vey, khasene gehat. Oy vey, oy vey, got married. Der rosh-yeshivenik hot tsu mazl kindelekh gehat. Oy vey, oy vey, kindelekh gehat. The rosh-yeshivenik, with good fortune, had chidren. Dos ershte hot geheysn Avreymele. Oy vey, oy vey, Avreymele. The first one was called Avreymele. Oy vey, Oy vey Avreymele. Dos tsveyte hot geheysn Burekhl. Oy vey, Oy vey, Burekhl. Oy vey, Oy vey Burekhl. Dos drite hot geheysn Getsele. Oy vey, oy vey Getsele. The third one was called Getsele. I recorded Vos hostu gelernt mayn kind in kheyder? (“What Did You Learn My Child in Cheder?”) at a zingeray/song gathering in the Bronx in 1983, at the home of Merke (Mary) and Tuvia Levine, on Gun Hill Road. I cannot recall the singer‘s full name– Harris was his last name. This children‘s folksong that follows the letters of the alef-beys has a number of variants. 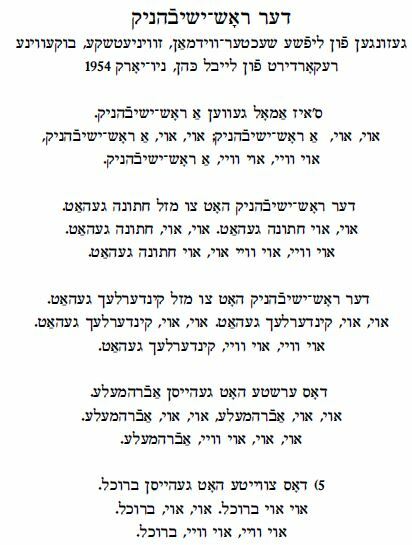 In Pipe‘s collection from Sanok, Galicia, his version begins „Az du zest, yingele, an alef, vi azoy makht es?‟ In my mother and grandmother‘s version it begins „Vos lernstu yingele?‟ (see Pipe‘s variation on page 202-205, it has verses all the way to „yud,‟ and the footnote by Dov and Meir Noy on page 316 in Shmuel Zanvel Pipe Yiddish Folksongs From Galicia, ed. Dov and Meir Noy, Israel, 1971). There are some interesting differences in the words that are „taytshed‟ in each stanza. In Beregovsky-Feffer‘s collection, Kiev, 1938, the music is also printed. All the variants are similar, textually and melodically, but never exactly the same. Most other versions ask the question „Vos makht es in eynem?‟ (What does it sound like together?) but Harris sings it as an imperative „Makht es in eynem‟ or „Put it together‟….which also makes sense. In the opening verse, when Harris sings „nokh a taytsh‟, it‘s clear that he should have then sung „a shtekele‟ and not „ay ay‟ for a second time. Harris, Merke and Tevye Levine were part of the linke (leftist) Yiddish cultural scene that did not usually mix with Arbeter-Ring members or Zionists. Our “scene‟ from the Sholem-Aleichem Folk Institute, played down politics, and emphasized the cultural aspects so we mingled fine. By the late 1970s, the Yiddish world was so depleted that the walls between left, center and right, were falling down on behalf of Yiddish culture, so the Levines became prominent members of the Sholem-Aleichem Folkshul on Bainbridge Avenue. Thirty years earlier they were active in their own linke shuln, but by the 1970s, those folkshuln no longer existed. Our zingerays included them more and more. That older generation of linke Yiddishists is gone; Itche Goldberg, who died recently at 102, was perhaps the last of them, and I cannot think of anyone who is alive anymore to even ask about the singer‘s– Mr. Harris‘s– first name. Vos hostu gelernt mayn kind in kheyder? What are you learning my child in cheder?